How to be a CSIS Member? Members of CSIS are admitted via membership of ICSA Singapore Division. 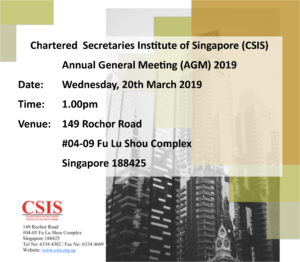 For more information regarding the entry requirements of the ICSA Singapore Division membership, please visit the website at www.saicsa.org.sg.There are 2 grades of membership: Associate and Fellow. Associates are applicable to all Associates of ICSA Singapore Division; Fellows require a higher level of experience and responsibility within the organisation, and applies to all Fellows of ICSA Singapore Division. Associates are individuals who are professionally qualified, working in various fields ranging from corporate service providers to administration to education. Fellows are individuals who have demonstrated expertise in their fields, accumulated from many years of experience, with exemplary conduct commended by many. Members of CSIS are able to consider themselves as “Chartered Secretaries”. CSIS is committed to ensuring the continued competence of and high standards of work by its members through ongoing education. CSIS has organised training and educational programs to emphasise the need for an integrated approach to professional development, involving not only corporate secretarial practices, but also the areas of business, management, practice management and personal development. CSIS has developed and organised programs to equip members with up-to-date and relevant knowledge, skills and abilities beyond the classroom. Programs organised, must always remain aligned with the fast changing landscape of practice and needs of the profession. All CSIS members are required to accumulate a minimum of 35 Continuing Professional Education (CPE) hours a calendar year. In the year of membership election, the CPE hours will be pro-rated according to the month of election. Cheque to be made payable to “CSIS”. Please indicate your Full Name and Tax Invoice number at the back of the cheque for easier payment tracking. Official receipt will mailed out 7 days after CSIS acknowledges receipt of cheque. Please email to admin@csis.org.sg to request for CSIS wire transfer details. For interbank transfers by internet banking, Please indicate your full name and/or tax invoice number in the “Initial” or “Comments” section of the transaction and drop us and email with the transaction details after the transfer is complete for easier payment tracking. Members may drop by the Secretariat to make payment by NETS. Any enquiries regarding payment please email to admin@csis.org.sg. The CSIS Practising Certificate Scheme was first introduced in November 1985. The Scheme is for CSIS members (ACS/FCS) who are in public practice. All members holding the CSIS Practising Certificate are considered Practising Chartered Secretaries. The application of these regulations is limited to every member in public practice as a Chartered Secretary in Singapore. A member, to whom the CSIS Practising Certificate (PC) to practise in Singapore is awarded, may practise elsewhere in the world, except in other territories where a practising certificate to practise is required. Separate application must be made to practise in those territories, in accordance with the regulations for the time being in force in those territories. A member who offers, provides or holds himself out as offering or providing advice or services to the public for fees and who for that purpose uses the description “Chartered Secretary” shall for the purpose of these regulations be regarded as being in public practice as a Chartered Secretary. The CSIS Council shall have sole discretion in determining whether a member is engaged in public practice as a Chartered Secretary for the purpose of these regulations. The award or renewal of a practising certificate is at the discretion of the CSIS Council. (ii) The applicant is able to satisfy the CSIS Council that he has adequate experience in the subject areas in which he proposes to practise. Application for a practising certificate must be made on an official application form and accompanied by the prevailing fee. Practicing certificates must be renewed annually on payment of the renewal fee. The applicant must at the time of issue of the practising certificate, and for as long as he continues to hold it, be in possession of professional indemnity insurance to the satisfaction of CSIS Council. The insurance must be valid in all territories where the member wishes to practice, and in respect of all activities, which he is undertaking or proposes to undertake. (a) The minimum level of cover under the professional indemnity insurance scheme shall generally be $500,000 for any one claim. (b) All members applying for practising certificates shall be required to take out insurance under a policy which the CSIS Council considers to cover all the activities which the member is undertaking or proposes to undertake. If a practising certificate is withdrawn for any reason it must be returned to CSIS. Any member, as defined in these regulations, who engages in public practice without being in possession of a current CSIS Practising Certificate is liable to disciplinary actions under the CSIS’s Bye-Laws. A member holding a practising certificate may at any time be required to provide the CSIS Council with such details of his practice as the CSIS Council may require. CSIS shall maintain a register of members holding current practising certificates in Singapore. A directory of CSIS Practising Chartered Secretaries is posted on CSIS’ website at https://csis.org.sg/index.php/practitioners-directory/ . Members who are interested to apply for the CSIS Practising Certificate Scheme please fill in the application forms and submit the original hard copy application form to the Secretariat. Note: All application forms have to be submitted in its original hardcopy format. Applications will not be tabled for approval unless supported with the appropriate additional information as requested by the Secretariat. For any enquires on the practising certificate application form, please email to members@csis.org.sg or call 6334 4302. The Council of the CSIS requires Chartered Secretaries in public practice in Singapore must hold the CSIS Practising Certificate and to observe an appropriate set of rules that commensurate with the responsibilities and privileges which characterize the profession. Practising Chartered Secretaries will continue to be bound by the CSIS Constitution and Bye-laws. This Code is complementary to the CSIS Constitution and Bye-laws. Public Practice: A Chartered Secretary who is the holder of a current CSIS Practising Certificate and who offers, provides or holds himself out as offering or providing advice or services to the public for fees is deemed thereby to be engaged in public practice. Practitioner: A Chartered Secretary in public practice who is the holder of a current CSIS Practising Certificate. 1. A Practitioner shall conduct himself in a manner consistent with the good reputation of the profession of the Chartered Secretary and of CSIS, the CSIS Constitution and Bye-laws, the CSIS’ Constitution, and in compliance with all statutory or other legal requirements. 2. In accepting or continuing a professional assignment or appointment, a Practitioner shall always have regard to any factor, which may reflect adversely upon his integrity and objectivity in relation to that assignment or appointment. 3. A Practitioner shall carry out his professional work with proper regard to the technical and professional standards expected of a Chartered Secretary. He shall not undertake or continue professional work that he is not competent to perform unless he first obtains such advice and assistance as will enable him competently to carry out such work. 4. A Practitioner shall conduct himself with courtesy and consideration towards all with whom he comes into contact. 5. Professional independence is a concept fundamental to the profession of a Chartered Secretary. It is essentially an attitude of mind characterised by integrity and an independent approach. Accordingly a Practitioner shall inform all interested parties on any potential conflict of interests. 6. A Practitioner receiving privileged information from a client or from any other confidential source in the course of his professional work shall not use it or appear to use it for personal advantage or for the advantage of a third party and may not disclose it without prior written consent unless there is a public duty or a legal or professional obligation or duty to disclose such information. 7. A Practitioner shall not advertise his professional services or skills except in accordance with the CSIS Code of Practice on Advertising. 8. A practice of which a Practitioner is either a partner or a director may not describe itself as “Chartered Secretaries” unless it is within the terms of the CSIS Bye-laws. 9. A Practitioner shall not in any circumstances obtain or seek professional work for himself or another Practitioner in contravention of this Code. 10. A Practitioner shall not give any commission, fee or reward whatsoever to a third party, not being either his employee or another Practitioner, in return for the introduction of a client. 11. A Chartered Secretary who is the holder of a current CSIS Practising Certificate shall not hold himself out as carrying on business of a kind which is normally carried on by a Practitioner, for or on behalf of his employer, unless his employer is permitted to describe itself as “Chartered Secretaries” in the CSIS Bye-laws. 12.1 request the prospective client’s permission to communicate with the previous appointee. If such permission is refused he should decline the appointment. 12.2 On receipt of the client’s permission, request in writing of the previous appointee all information relevant to an acceptance of the appointment. 13.1 request permission of the client to discuss the client’s affairs freely with the proposed appointee. If this request is not granted the Practitioner shall report that fact to the proposed appointee. 13.2 On receipt of written permission from the client he shall disclose all information relevant to the Practitioner’s acceptance of the appointment. 14. A Practitioner invited to undertake professional work additional to that already being out by another Practitioner who is himself to continue his existing duties for the client, shall as a matter of courtesy, notify in writing the other practitioner of the work that is proposed to be undertaken. This notification need not be given if the client gives in writing a valid reason against it. The Practitioner undertaking such additional work is entitled to expect of that other Practitioner to whom he has given notice full co-operation in carrying out such additional work. 15. Any Practitioner who act in association with others not being members of CSIS either through the medium of an unlimited company or in partnerships, in the provision to the public of services usually undertaken by a Practitioner thereby is deemed to accept responsibility to the Institute for ensuring that in providing such services that the Institute does not describe as “Chartered Secretaries” but is conducted in accordance with this Code. 16. A Practitioner may act alone or in association with members of other professional bodies to provide professional services additional to services usually undertaken by a Practitioner or any of his associates do not do anything which is or may be in breach or contravention of any legal, ethical or other requirement governing members of such professional bodies. 17. A Practitioner who is also a member of another professional body shall not in providing services usually undertaken by a Practitioner do anything in breach of any legal, ethical or other requirement governing members of that professional body. 18.3 the directors jointly and severally are directly responsible to the Institute for the conduct of the officers of the company, as if it was a firm in which they were the only partners. Any company which does not comply with this section may not describe itself as “Chartered Secretaries”. 19. Any promise or undertaking made or given by a Practitioner in the course of his business must be honoured promptly in full since the Institute considers that it is essential that absolute reliance can be placed on such a promise or undertaking. 20. Any breach of this Code may be deemed to be a matter for investigation by the Disciplinary Committee. These regulations have been devised because the Council of the Institute now require Chartered Secretaries in public practice who hold or deal with the money belonging to clients and third parties are to observe the accounts regulations in maintaining an appropriate set of rules. Sections 2 to 11 apply to clients’ accounts and Sections 12-18 to third party accounts. Sections 19-22 are applicable to both clients and third party accounts. “Public Practice” Any Chartered Secretary who is the holder of a current CSIS Practising Certificate and who offers, provides or holds himself out as offering or providing advice or services to the public for fees is deemed thereby to be in public practice. “Practitioner” Any Chartered Secretary in public practice who is the holder of a current CSIS Practising Certificate. “Council” The Council of the Institute as defined in the Constitution and Bye-laws and any Standing Committee to which Council has properly delegated its authority to act under these obligations. (i) money held or received on the account of the trustees of a trust of which the practitioner is a trustee. (ii) Money to which the only person entitled is the practitioner himself or in the case of a firm or company, one or more of the partners or directors. “Client” Any person on whose account a practitioner holds or receives “client’s money”. “Client Account” A current or deposit account in the name of the practitioner at a bank in the title of which account the word “client” or the name of the beneficiary appears. “Third Party Money” Money belonging to a third party held or received by a practitioner in connection with a client for whom he is acting in any capacity as a practitioner. “Third Party” Any person on whose account a practitioner holds or receives “third party money”. “Third Party Account” A current or deposit account in the name of the practitioner at a bank in the title of which account the word “third party” or the name of the beneficiary appears. “Bank” Any bank licensed by The Monetary Authority of Singapore. 2.1 Every practitioner who holds or receives clients’ money shall without delay pay such money into a client account. 2.2 Any practitioner who holds or receives clients’ money must keep at least one client account or as many such accounts as he thinks fit. 3 Interest shall be paid to a client where the sum of money is received for or on account of a client which exceeds S$5,000/- and at the time of its receipt is unlikely within two months thereafter to be reduced to a sum less than S$5,000/-. 4 No money, other than money which under the following regulations a practitioner is required or permitted to pay into a client account shall be paid into a client account, and it shall be the duty of a practitioner into whose client account any money has been paid in contravention of this regulation to withdraw the same without delay on discovery. 5.2 money to replace any sum which for any reason may have been drawn from the account in contravention of regulation 7 of these regulations. 6.2 he may pay such a cheque into a client account. 7.3.2 where such drawing may have been expressly authorised in writing by a client beforehand. 7.8 money agreed by the client due in consequence of a decision of the court for payment to the practitioner. Provided that money drawn on behalf of a client under sub-paragraphs 7.1, 7.2, 7.3, 7.4 or 7.5 of this paragraph shall not exceed the total of the money held at the time of such drawing on behalf of that client. 8.2 a transfer to a bank account in the name of the Practitioner, his firm or company, not being a client account. 9.1.4 in exceptional circumstances, a person not falling within 9.1.1 to 9.1.3 above expressly authorised by the Council. Provided that where any signatories referred to in 9.1.3 or 9.1.4 above are appointed the Practitioner shall arrange adequate fidelity insurance cover wither separately or as an extension to the practitioners’ professional liability insurance. 9.2 Notwithstanding the provisions of these regulations the Council of the Institute may on the application of any Practitioner or of its own motion authorise the withdrawal of money from a client account in circumstances which would otherwise not be permitted by these regulations. 10.2 if the money is received by him in the form of a cheque or draft which is without delay endorsed over on behalf of the client to another party and is not passed by the Practitioner through the bank account. 11.3 which the client for his own convenience requests be withheld from such account, the request to be in writing from the client and acknowledged in writing by the Practitioner. 12 Every Practitioner who holds or receives money to which a third party is entitled shall without delay pay such money into the relative third party account. 13 No money, other than money which under the following regulations a Practitioner is required or permitted to pay into a third party account shall be paid into a third party account, and it shall be the duty of a Practitioner into whose third party account any money has been paid in contravention of this regulation to withdraw the same without delay on discovery. 14 There may be paid into a third party account in addition to money to which the third party is entitled such money belonging to the Practitioner as may be necessary for the purpose of opening or maintaining the account or money to replace any sum which for any reason may have been drawn from the account in contravention of regulation 17 of these regulations. 15.2 If he does not split the cheque, he may pay into a client account as permitted by regulations 2 to 11. 16.5 money agreed by the third party due in consequence of a decision of the court for payment to the Practitioner. 17 No money other than money permitted by regulation 16 of these regulations to be drawn from a third party account shall be so drawn unless the Council upon an application made to them by a member expressly authorise in writing its withdrawal. 18.2 if he receives the money in the form of a cheque which is without delay endorsed over on behalf of the third party to another party and is not passed by the Practitioner through a bank account. 19.1.2 to distinguish the same from money received, held or paid by him on any other account. 19.2 Every Practitioner shall preserve for at least six years from the date of the last entry therein all accounts kept by him under this regulation. 21 Before instituting an inspection on a written compliant lodged with item by a client or third party the Council shall require prima facie evidence that a ground of compliant exists, and may require the payment by such party to the Council of a reasonable sum to be fixed by them to cover the costs of the inspection, and the costs of the Practitioner against whom the complaint is made. The Council may deal with any sum so paid in such manner as they may think fit. 22 Every requirement to be made by the Council of a Practitioner under these regulations shall be made in writing under the hand of the Secretary of the Institute and sent by registered post or recorded delivery service to the last address of the practitioner appearing in the register kept by the Institute and, when so made and sent, shall be deemed to have been received by the practitioner within forty-eight hours (excluding Saturdays, Sundays, and Public Holidays) at the time of posting. 23 Nothing in these regulations shall deprive a practitioner of any recourse or right, whether by way of lien, set off, counter-claim, charge or otherwise, against monies standing to the credit of a client or third party account. 24 Any breach of these regulations may be deemed to be a matter for investigation by the Disciplinary Committee. If you have recently changed your contact details and/or your employment details, please notify CSIS by completing the form below. ** Is the organisation a Registered Filing Agent (FA)? ** Are you a registered Qualified Individual (QI)? Please indicate below if you allow CSIS to disclose your membership (i.e. Full Name as per membership register and membership grade) on the CSIS Membership Directory on the CSIS Website. I agree to disclose my membership on the CSIS Membership Directory I do not agree to disclose my membership on the CSIS Membership Directory.